Multicultural radio station Fairchild Radio organized its second Pink Day at Aberdeen Centre in Richmond on October 23 and raised over $3,700 in four hours. All proceeds were donated to the Canadian Breast Cancer Foundation to fund the research, treatment and prevention of the disease. (from right to left): Fairchild Radio DJs Jieying Chen, William Ho and Deborah Moore selling the pink mittens and pink socks for charity. With an eye-catching pink colored booth set up near the food court from noon to 4pm, Fairchild Radio’s DJs and staff attracted a big crowd during the mall’s busy lunch hour. Many fans also came to support their favorite on-air personalities who sold the Foundation’s pink pins, pink socks and pink mittens for charity. One of the listeners, who wanted to remain anonymous, even made a donation of $1,000 at the booth. (from left to right): Fairchild Radio DJs Anita Lee, Mandy Chan and Vivian thanked donors for their generous donation. On top of the charity booth on Pink Day, Fairchild Radio also promoted awareness of breast cancer for the whole month of October. Interviews, forums and 1-min educational segments were produced and aired on AM1470 and 96.1FM. 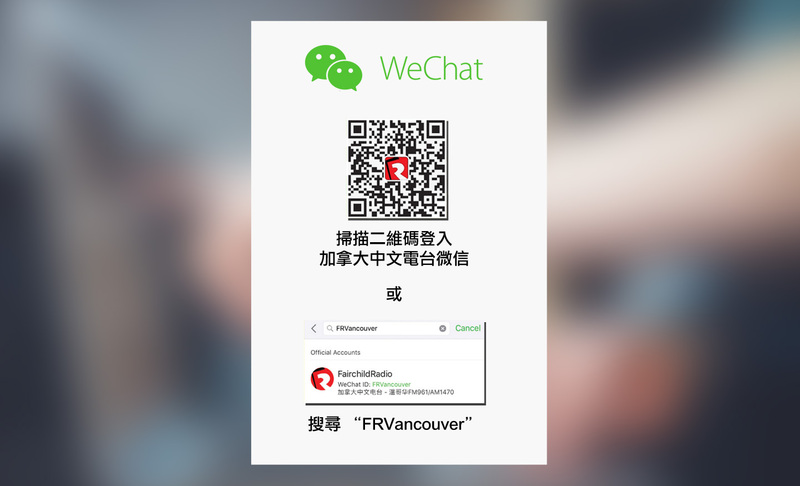 Similar programming was also done by Fairchild Radio’s branch stations in Toronto and Calgary. No contribution too small! 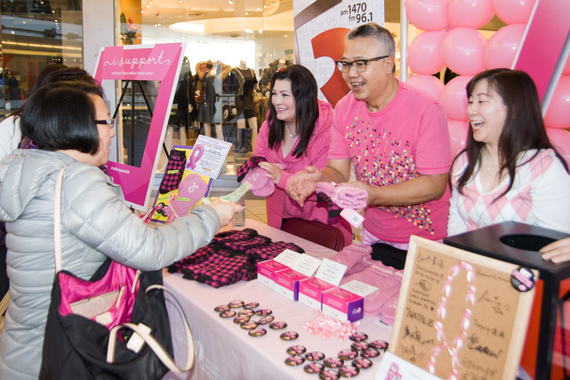 A donor (wearing black) buying a pink ribbon pin for $2 from DJs (left to right) Janice Fan, Brian Chiu, Jennie Chen and Brenda Lo.